This is the second of six reviews of Bulgarian wine this month, and the second of three by Ivo Varbanov. 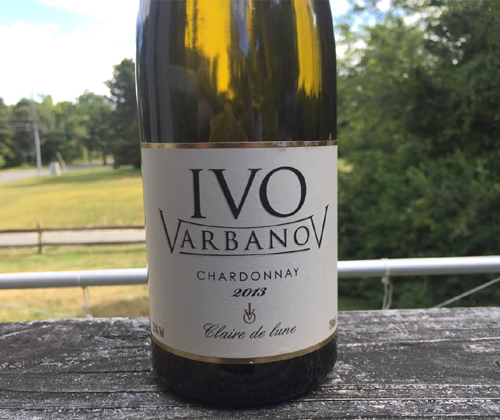 Those wines by Ivo are his 2011 Merlot-Syrah "Sheherazade", this 2013 Chardonnay "Clair de Lune" I'm reviewing today, and his 2011 Syrah "Feux d’artifice". The wine is 100% Chardonnay that was fermented in Bulgarian oak for a year. Filtering and fining were minimal. Of course I'll be listening to the song while I taste this wine, and you should too. The color is a light gold. There's aromas of white flowers, kiwi, ginger and oak. It's medium bodied, creamy in mouthfeel, has a slight touch of sweetness, and there's some expressive acidity on the swallow. There's flavors of vanilla pudding, ginger, and kiwi and melon. It finishes with kiwi, spicy ginger and an uplift of acidity. The reasons why I like this Chardonnay are 1) it's yummy 2) the kiwi and ginger qualities 3) it seems to meet the Chardonnay styles right in the middle. By the latter I mean it's not full bodied but it's still creamy in texture, it's not overly malo'd and not annoyingly lactic, you can taste and smell the oak but it's not like biting into a 2x4, and that oak is clearly the real deal instead of oak staves or oak essence. So it's incredibly versatile. You can drink this with anything, with anybody, at any time, or by itself, with yourself, and still enjoy every sip. I bet it would be at its absolute best with sashimi, nobody else, and a whole world of quiet. Or a soothing piano like in "Clair de Lune".